Samsung has been struggling to collect all shipped units from its recently discontinued Galaxy Note 7 lineup, but it turns out the phone-maker might’ve been recalling the wrong devices all along. 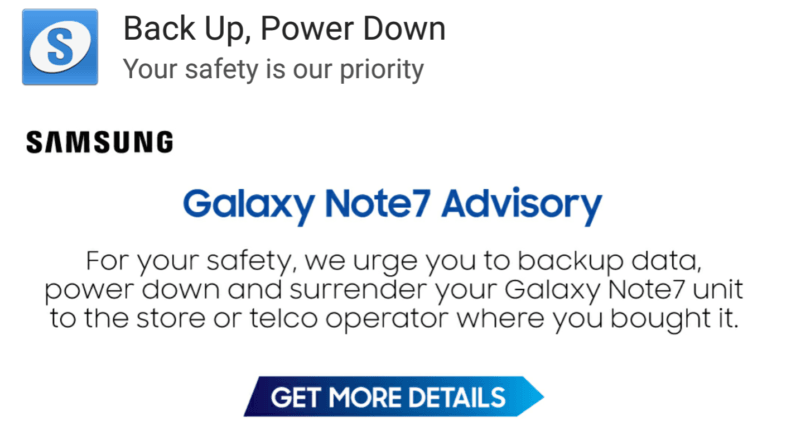 Yesterday, Redditor Dominicedcel shared a screenshot of a safety warning he received from Samsung, kindly prompting him to turn off his Note 7 and “surrender” the device to one of the designated stores or carriers. While that’s hardly surprising given the South Korean giant has been running special exchange programs for some time now, there’s one problem – Dominicedcel owns a three-year-old Note 4. The confusion is only partially Samsung’s fault though. Unlike your ordinary Android user, Dominicedcel has opted to flash the Note 7 ROM onto his older Note 4 device – a tweak that only a tiny fraction of smartphone enthusiasts is capable of performing. To give you the gist of it, ‘flashing’ refers to the process of swapping out the factory-set version of Android on your phone with other custom-built variants of the operating system. Although this is standard practice in dedicated developer communities and internet forums, it turns out that porting the Note 7 ROM to older Galaxy phones is tricking Samsung into treating them as actual Note 7 devices – and this might be a cause for concern for a number of reasons. Flashing Note 7 ROM on older Galaxy smartphones is not only making it more difficult for Samsung to identify and locate legitimately hazardous units, but also interfering with the use of perfectly safe devices. While swapping out the factory-set Android version on your phone with the newer ROM won’t cause your smartphone spontaneously combust, Samsung recently began remotely blocking recalled Note 7 units from connecting to mobile networks. There’s also been numerous reports that Samsung has been forcing software updates to prevent affected devices from charging past the 60 percent mark of battery life. If Samsung is able to send notifications urging owners to return older Galaxy phones running Note 7 ROM, it’s plausible the phonemaker can also enforce other measures to convince customers to exchange their “faulty” smartphones. At this point this is merely a speculation – but certainly one well within the realms of possibility. So unless you’re willing to risk getting your cellular connectivity restricted or your battery capacity capped, we strongly advise against porting the Note 7 ROM to your older Galaxy phone – at least for the time being. We’ve contacted Samsung for further comment and will update this piece accordingly if we hear back.